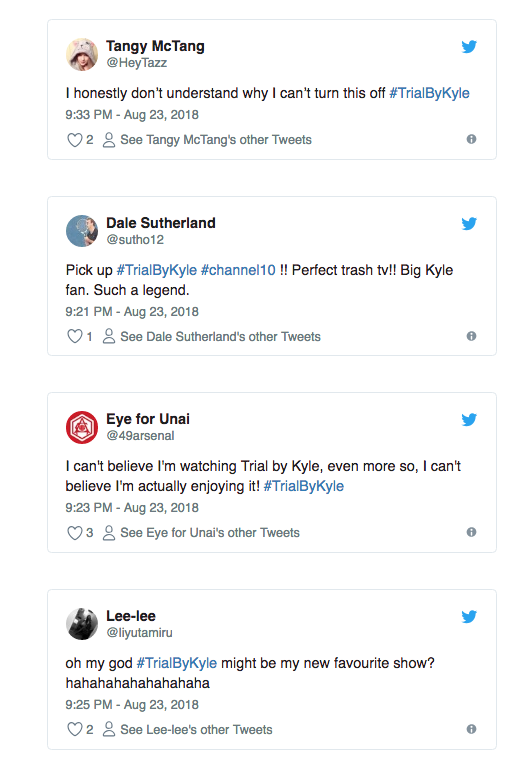 Ten appears to have found itself the hit of its ‘pilot week’ after last night’s Trial By Kyle enjoyed some particularly positive social media feedback. Unfortunately for the show, which stars radio shock jock Kyle Sandilands badly impersonating Judge Judy, actual viewer numbers weren’t as buoyant as the network would’ve hoped. Last night’s debut pulling just 385,000 according to overnight OzTam numbers. Still, the social media buzz would give Ten bosses hope that the show has legs for a full series in 2019. Comments to Twitter were generally along the lines of “trash TV” but “highly entertaining”. In worse news for Ten, even the strongly performing Bachelor (807,000) couldn’t stop the network being relegated to fourth spot in last night’s viewer numbers. Seven won the night with 28.2 per cent, Nine had 25 per cent, the ABC claimed third with 19.7 per cent, Ten had to settle for 19.5 per cent and SBS pulled 7.7 per cent. Seven’s 6pm news bulletin was the most watched show of the night with 960,000. Other standouts for the network were Home And Away (604,000), The Chase (564,000), Border Security (426,000) and Beach Cops (373,000). Nine went The Block-free, its best was its 6pm news with 838,000, followed by ACA with 687,000, Hot Seat (451,000) and the Tigers-Manly NRL game (324,000). The Bachelor and Kyle aside, Ten’s other highlight was The Project with 483,000, while Pointless (236,000) continues to flounder. The ABC’s night went thus: 7pm news (734,000), 7.30 (681,000), Grand Designs Australia (449,000), Sammy J (321,000), Everyone’s A Critic (262,000), Diana: 7 Days that Shook The World (260,000) and Think Tank (202,000). Over at the SBS, its best was Tony Robinson Down Under pulling a very un-Australian 265,000.